Many years ago, far too many to count, my mom gave me a big glass jar of her homemade laundry soap. I took it with me to college and used it without really understanding what it was she was giving me other than some free soap. You see, when others make things for you they are giving you much more than the gift itself, this I have come to understand and really appreciate. With homemade anything, the giver is giving you time. They are giving you kindness. Most importantly, they are giving you a bit of themselves. This is one big reason among many others I feel homemade is better. And when you make something like a cleaning product you are giving yourself and your family such a wonderful gift. Then there’s the fact that when you make something yourself you know what’s in it. These days, this is quite a luxury! Two ingredients, you say? How is this possible? Let me show you. Making things for yourself and your home does not have to be complicated. Companies want you to think that it is because then they get your money and then you get sucked in and those pretty packages sort of leap into your cart. I get it. I used to have that happen to me too! But when you look at the things we buy from stores and run your finger along the long list of foreign ingredients, it’s clear that maybe a little more intention in what we use throughout our day can go a long, long way towards healthier and more mindful living. With that in mind, I like making as many homemade products as possible when possible. 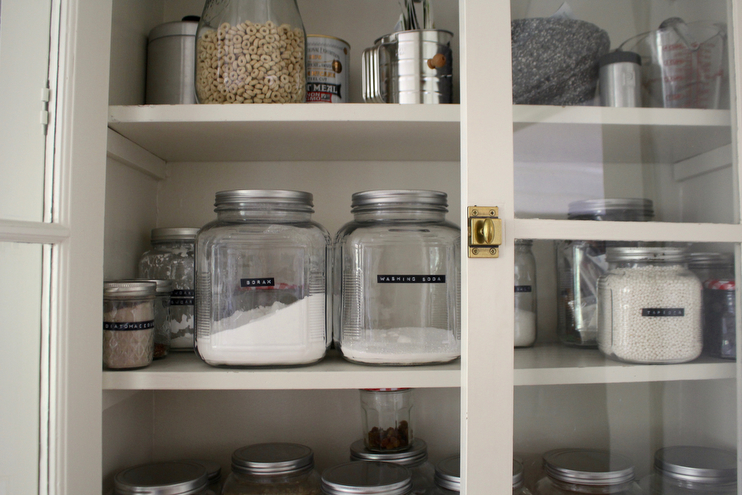 I don’t take this path because I enjoy making messes in the kitchen and getting all scientific with cleaning products, I do it because it’s really much easier, more cost effective, and healthier than the alternatives out there. It is also pretty fun once you get the hang of it! And as I have found, once you have a cleaning pantry of items at your disposal you can whip up these products in a matter of minutes. When you find yourself out of detergent or fabric softener, just get out your food processor and a few minutes later you are good to go with laundry without having to get all the kids in the car. What could have taken you well over an hour has now taken three minutes. I like this part a lot. Moral of this sort: homemade is best. 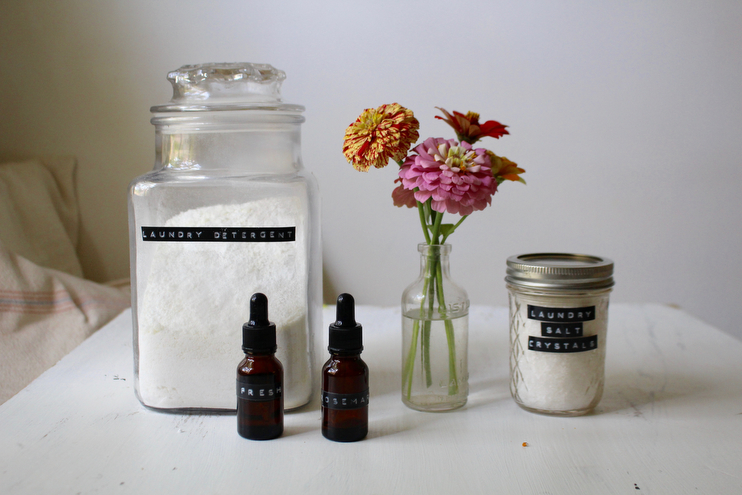 Here are two wonderful homemade recipes you can take with you from my laundry room to yours. This process could not be simpler. Chop up your bar of soap into quarter size pieces and place into your food processor, following with the washing soda and borax. Pulse until you get a fine powder and the castile soap is broken up into very small pieces. Add your essential oils and pulse a few more times. Use one tablespoon per load to the bottom of your washing machine before adding in your clothing. This should last you quite awhile. And guess what, I still have that same old jar from my mama use it for detergent till this day. That makes me happy. And simpler yet is this natural fabric softener recipe. Just add your ingredients to a small mason jar and shake. Done! Add one tablespoon to the bottom of your washing machine before adding your clothing. Note: this is much safer than fabric softener that you can find in most stores. Did you know fabric softener is one of the most toxic things you can bring into your home? We had so many problems with it when Theo was a baby due to eczema and after reading up on ways to help his skin, I threw all our store bought fabric softener away and started making my own without the harsh chemicals that was bad for both our skin and the environment. You can read more about this here if interested. White vinegar – Use this as a rinse (1/2 cup or so) to get the excess detergent off and dissolve the salts. This is also a great way to help keep your whites white. I add this to the bleach compartment of our washing machine. You can read about the beauty of line-dried clothes here. If you’re interested in learning more about essential oils, head here. I will make some of yours. I so appreciate you sharing your recipe with us. Just a quick question in regards to the detergent, can this be used for all loads, including delicates & darks? I would love to take Woolite off my shopping list. Hi sweet mama– is one tablespoon enough for even large loads? So just mix 1tbs detergent and 1tbs softener ? will be passing this recipe onto my daughter. she will love it. but she is also using items in the kitchen that i used in mine and going even into what my mother used in hers. very basic. i’m 62. 🙂 that being said. she (nor i) have a food processor. 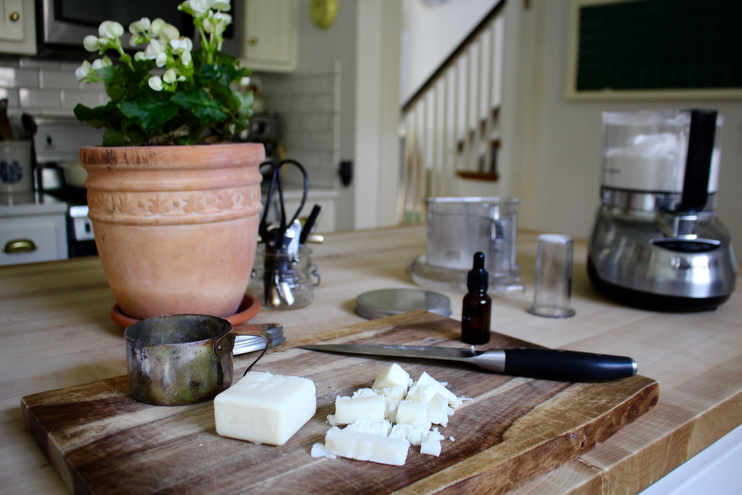 what would you recommend using to mix and chop the castile soap? if i’m reading correctly, soap and softner goes into the machine together? also on a side note. not sure if it’s my laptop but your font print for the comments is very difficult to read. very light where as the other print is darker. wonder if it’s just me? Stacia, I honestly think a food processor is the only thing that will do the trick here. You’ll need to get it very finely chopped and this tool is one that does the job well. I use ours for many other things in the kitchen and have found it to be a wonderful things to have on hand. You can find them for pretty affordable prices on Amazon, here’s one with good reviews for a nice price. Katie, you are most welcome! The amount of EO’s are totally up to you (I think 20 is a good balance for this detergent recipe) and as you well know offer different benefits depending on the oil you use…so I would take that info. and go from there. That is the beauty of making your own, you get to choose! Hello! I have just made my first batch- and then I dawned on me- will this work for cold washes? Hello! These recipes sound great and i’m eager to make my first batch. I’m just wondering, do you add the vinegar at the beginning of the wash along with the detergent and fabric softener? Or do you add it afterwards with an extra rinse cycle? Thanks! Brianna, you know…I think that this is just part of using natural vs. chemicals. I know exactly what you mean about loving that just-washed smell…but one idea I have is to use wool dryer balls and essential oils. I usually put a few drops of purification (a YL blend) on the them and our clothes always smell really good after having been dried. Pine is another great oil to get a fresh smell. Hope this helps! Hello Amanda! Thank you so much for sharing this wonderful natural detergent. I’ve been dying to find one like this, and you made it so easy! It smells so lovely too with the different oils you can add. I was wondering where you got your little metal/wooden measuring spoon? It’s the cutest! My daughter just introduced your site to me today.I had her bookmark it for me. I was impressed by your pictures and the general layout.There is to me, a certain sense of serenity and warmth. I will keep coming back! I stay away from chemicals in our household for sure, so I have been meaning to make this for a while now. I like to do my research beforehand and I came across this and found it interesting – was wondering if you could give the above article a read and let me know your thoughts. Her theory comes from a scientific approach claiming that the soap in a homemade mix such as this causes lots of yucky build up and is altogether ineffective… and she has some pictures to show. Thank you, Amanda. I started following your Instagram page some time early this year, and your page/blog reminds me to slow down when life becomes too busy. I’m moving away from home at the end of this year for the first time ever to start a pre-dental master’s program (several hours from where I’ve spent my entire 22 years), so I’ve been looking for ways to bring home comforts with me as well as create some routines in this new season of life. I’m also getting married in March, but my future husband won’t be able to live with me during most of the week because his work is back home. In short, I’m struggling to cope with the amount of change that is headed my way. With that being said, I love these simple things. Laundry. How beautiful it is that I can be so excited to make laundry detergent that my future husband and, one day, little family will remember when they are old. It’s these small, intentional pieces of life that nurture my soul. It’s the time taken to make something with care, love, and slow hands that resets my focus away from studies and back to acknowledging the human person- the reason I’m studying in the first place. So again, thank you for showing me ways to live slowly in all aspects of life. Thanks, for inspiring me to live peacefully even when your job is never ending, incredibly challenging, yet, as a whole, so so rewarding. Thanks for reminding me that I can make a beautiful, comforting home wherever I am with just a bit of intentionality. Finally, thank you for showing me how to love myself, especially when my man won’t always be around to remind me. You are so strong! Keep shining your light, sister. And.. to all you lovely, wise ladies in this community that read this. I am young, and I am in need of ALL your feminine wisdom. Advice is always welcome.